Nov. 6 (Bloomberg) -- Crude oil tumbled after the Labor Department reported that the U.S. unemployment rate surged to a 26-year high, undermining speculation that fuel consumption will rebound next year. Oil dropped 2.8 percent after the report showed that payrolls fell by 190,000 workers in October, sending the unemployment rate to 10.2 percent. Total U.S. fuel demand over the four weeks ended Oct. 30 was 4.5 percent lower than a year earlier, the Energy Department said on Nov. 4. Crude oil for December delivery fell $2.19 to $77.43 a barrel on the New York Mercantile Exchange, the lowest settlement since Oct. 30. Oil is up 74 percent this year. Gasoline for December delivery declined 6.34 cents, or 3.2 percent, to end the session at $1.9243 a gallon in New York. It was the lowest settlement price since Oct. 14. Heating oil for December delivery dropped 5.41 cents, or 2.6 percent, to settle at $2.0035 a gallon. The jobless rate grew from 9.8 percent in September. Revisions added 91,000 to payroll figures previously reported for September and August. Payrolls were forecast to drop 175,000 after an initially reported 263,000 decline for September, according to the median estimate of 84 economists surveyed by Bloomberg News. “Seeing the rate rise above 10 percent has taken some of the air out the bubble, and raises questions about the recovery,” said Gene McGillian, an analyst and broker at Tradition Energy in Stamford, Connecticut. The U.S. economy has lost 7.3 million jobs since the recession began in December 2007, when the unemployment rate stood at 4.9 percent. Oil futures gained of 0.6 percent this week. The contract had been pushed higher earlier this week by an Energy Department report showing crude-oil supplies unexpectedly dropped last week. U.S. inventories of crude oil fell 3.94 million barrels to 335.9 million in the week ended Oct. 30, according to the Energy Department. The drop left supplies 7.2 percent higher than the five-year average for the period. Stockpiles of gasoline and distillate fuel are also higher than average. Oil fell 1 percent yesterday as U.S. equities surged. It was the first time since Oct. 27 that oil had not moved in the same direction as the Standard & Poor’s 500 Index. The Reuters/Jefferies CRB Index of 19 commodities declined 1.6 percent to 269.81. Brent crude oil for December settlement declined $2.14 or 2.7 percent, to $75.85 a barrel on the London-based ICE Futures Europe exchange. Oil volume in electronic trading on the Nymex was 540,588 contracts as of 3:01 p.m. in New York. Volume totaled 411,506 contracts yesterday, the least since Sept. 28 and 27 percent lower than the average over the past three months. Open interest was 1.23 million contracts. The exchange has a one-business-day delay in reporting open interest and full volume data. Nov. 6 (Bloomberg) -- The dollar fell against the yen as the U.S. unemployment rate increased to 10.2 percent, reinforcing speculation the Federal Reserve will keep borrowing costs near zero into next year. Canada’s dollar dropped the most this month against the greenback as the nation’s employers unexpectedly eliminated jobs in October. Mexico’s peso and Norway’s krone fell against the yen on speculation the U.S. payrolls report will encourage traders to cut holdings of higher-yielding assets. The dollar decreased 0.9 percent to 89.93 yen at 3:28 p.m. in New York, from 90.71 yesterday. The euro fell 1.1 percent to 133.44 yen, from 134.92. The dollar traded at $1.4838 per euro, compared with $1.4871. The U.S. currency initially advanced as much as 0.4 percent versus the euro on reduced demand for riskier assets after the Labor Department reported that the unemployment rate exceeded 10 percent for the first time since 1983. The greenback erased its gain about an hour later on speculation the Fed will trail other central banks in raising borrowing costs. Employers eliminated 190,000 jobs in October after a reduction of 219,000 in the previous month, the Labor Department reported. The median estimate of 84 economists in a Bloomberg survey was for a reduction of 175,000. The dollar was headed for a 1 percent weekly decline versus the euro after the Fed repeated at the end of a two-day policy meeting on Nov. 4 its intent to keep interest rates “exceptionally low” for “an extended period.” The central bank held the target rate for overnight lending at a range of zero to 0.25 percent. Traders reduced bets that the Fed will increase borrowing costs in the first half of next year. Fed funds futures showed a 52 percent chance that policy makers would raise their benchmark by at least a quarter-percentage point by the June meeting. A week ago the likelihood was 63 percent. European Central Bank President Jean-Claude Trichet took a step yesterday toward removing emergency stimulus measures designed to end the recession, saying commercial banks won’t be offered unlimited 12-month loans next year. Policy makers kept the main refinancing rate at a record low 1 percent. The dollar will decline to $1.50 versus the euro by year- end and remain there through the end of March, according to the median forecast of 48 economists in a Bloomberg survey. The Dollar Index, which IntercontinentalExchange Inc. uses to track the greenback against the currencies of six major U.S. trading partners including the euro and yen, was little changed at 75.811 today. The gauge fell 0.2 percent on Oct. 2, when the Labor Department reported that U.S. employers eliminated more jobs in September than economists forecast. The index slid about 15 percent from a three-year high reached in March, dropping on speculation the Fed will be slow in raising borrowing costs. The index decreased to a 14-month low of 74.94 on Oct. 21. The dollar will resume its decline against counterparts as today’s payrolls report “confirms low rates in the U.S. until at least the second half of 2010,” said Achim Walde, head of currency management in Cologne, Germany, at Oppenheim KAG, where he helps oversee 3 billion euros ($4.3 billion). The Canadian dollar weakened as much as 1.2 percent, the biggest decline since Oct. 30, before trading at C$1.0763 per U.S. dollar, compared with C$1.0651. Employment fell by 43,200 last month, and the jobless rate rose to 8.6 percent, Statistics Canada said today in Ottawa. The median forecast of 22 economists in a Bloomberg survey was for a gain of 10,000 jobs. The Mexican peso slid 1.9 percent to 6.70 yen and the krone fell 1.3 percent to 15.78 yen on speculation investors will reduce carry trades, in which they sell the currency of a nation with low borrowing costs and buy assets where returns are higher. Japan’s benchmark lending rate of 0.1 percent makes the yen a favored target for investors seeking to fund such trades. Australia’s dollar rose for a third day against its U.S. counterpart as the Reserve Bank said the nation’s economy will expand at more than three times the pace forecast in August and signaled it will continue to lead the world in raising interest rates. The Aussie gained 0.7 percent to 91.62 U.S. cents. Group of 20 finance chiefs will likely urge Asian nations to allow their currencies to appreciate when they meet this weekend in Scotland, according to UBS AG. While exchange rates won’t be on the agenda, “many nations will seek to bring it up,” Geoffrey Yu, currency strategist in London at UBS, wrote in a research report to clients. Nov. 6 (Bloomberg) -- Crude oil traded near $80 a barrel in New York after falling yesterday on speculation that a government report will show that the U.S. unemployment rate climbed last month, depressing demand for energy products. Oil declined 1 percent yesterday on concern that the Labor Department will say the U.S. unemployment rate rose to a 26-year high in October. Total fuel demand in the four weeks ended Oct. 30 was 4.5 percent lower than the same period a year earlier, a Nov. 4 Energy Department report showed. Crude oil for December delivery traded at $79.76 a barrel, up 14 cents, in electronic trading on the New York Mercantile Exchange at 10:17 a.m. Sydney time. Yesterday, the contract fell 78 cents to settle at $79.62. Futures are poised for a 3.6 percent gain this week. An additional 175,000 jobs were probably lost in October pushing unemployment to a 26-year high of 9.9 percent, economists forecast before the Labor Department payrolls report due at 8:30 a.m. today in Washington. The government report is anticipated to overshadow other economic data released earlier this week as an indicator of fuel demand, according to Carl Larry, president of Oil Outlooks & Opinions LLC, a Houston-based energy adviser. Refineries operated at 80.6 percent of capacity, down 1.2 percentage points from the previous week and the lowest rate since the week ended April 10, the Energy Department said. The Standard & Poor’s 500 Index added 1.9 percent in New York yesterday. The Dow Jones Industrial Average increased 2.1 percent and closed above 10,000 for the first time since Oct. 22. The dollar traded at $1.4868 against the euro at 10:05 a.m. in Sydney, from $1.4871 yesterday. Brent crude oil for December settlement declined 90 cents, or 1.1 percent, to end the session at $77.99 a barrel on the London-based ICE Futures Europe exchange yesterday. Nov. 6 (Bloomberg) -- The dollar traded near a one-week low against the euro before a government report today forecast to show U.S. employers cut fewer jobs last month, boosting demand for higher-yielding assets. Japan’s currency headed for a weekly loss against the euro before a report today that economists said will show German factory orders increased in September for a seventh month. The pound headed for a second weekly advance against the dollar on speculation a U.K. report will show producer prices rose for a fourth month in October, backing the case for the Bank of England to refrain from lowering interest rates. The dollar traded at $1.4868 per euro at 9:09 a.m. in Tokyo from $1.4871 in New York yesterday, when it touched $1.4917, the weakest level since Oct. 27. The dollar has dropped 1 percent this week against the euro. Japan’s currency was at 134.99 yen per euro from 134.92, heading for a 1.7 percent loss this week. The dollar fetched 90.79 yen from 90.71 yen. On the week, the greenback has gained 0.7 percent. The pound traded at $1.6563 from $1.6583 in New York yesterday, when it climbed to $1.6636, the highest level since Oct. 23. It’s gained 0.7 percent on the week. The Labor Department is forecast to report U.S. employers eliminated 175,000 jobs in October after a reduction of 263,000 in the previous month, according to the median estimate of economists in a Bloomberg News survey. The data are due today in Washington. The U.S. unemployment rate probably rose to 9.9 percent last month from 9.8 percent in September, according to a separate Bloomberg News survey. The Federal Reserve on Nov. 4 repeated its intent to keep rates “exceptionally low” for “an extended period” as long as the inflation outlook is stable and unemployment fails to decline. Policy makers held the target rate for overnight lending between banks in a range of zero to 0.25 percent. Germany’s Economy Ministry is forecast to report factory orders rose 1 percent in September after gaining 1.4 percent in August, according to the median estimate of economists in a Bloomberg News survey. The data are due today in Berlin. The pound headed for a weekly gain against the yen after the Bank of England yesterday left its key rate at 0.5 percent and raised the amount of bonds it will buy to 200 billion pounds ($332 billion). It was less than the median forecast of 225 billion pounds in a Bloomberg News survey of economists. The price of goods at U.K. factory gates rose 0.2 percent in October after a 0.5 percent increase in September, a separate Bloomberg survey showed before the Office for National Statistics releases the data at in London today. The pound traded at 150.30 yen from 150.42 yen in New York yesterday. It’s gained 1.4 percent on the week. Nov. 5 (Bloomberg) -- Crude oil fell, snapping three days of gains, on concern an increase in stockpiles in a key storage area in the U.S. shows fuel demand has yet to recover. Oil slipped below $80 a barrel as inventories at Cushing, Oklahoma, where New York-traded West Texas Intermediate grade is stored, rose for the third time in four weeks. Oil also dropped before a report from the Labor Department, which is forecast to show that unemployment in the world’s biggest energy user rose in October. Crude oil for December delivery fell as much as 78 cents, or 1 percent, to $79.62 a barrel on the New York Mercantile Exchange. It was at $79.88 a barrel at 4:07 p.m. Singapore time. Yesterday, the contract rose 80 cents, or 1 percent, to settle at $80.40 a barrel, the highest since Oct. 23. Futures have gained 79 percent this year. Oil climbed to a one-week high yesterday after a report from the Department of Energy showed total crude supplies unexpectedly declined. Inventories fell 3.94 million barrels last week, the report said. A 1.5 million-barrel increase was forecast, according to a Bloomberg News survey of analysts. Stockpiles of crude in Petroleum Administration for Defense District 2, where Cushing is, rose 622,000 barrels to 78.1 million barrels for the week ended Oct. 30, the highest in six weeks. Supplies at Cushing gained 30,000 barrels to 25.5 million barrels. The Labor Department on Nov. 6 will report that the unemployment rate rose to 9.9 percent in October, from 9.8 percent the previous month, as companies cut another 175,000 jobs, according to the median forecasts in a Bloomberg News survey of economists. The MSCI Asia Pacific Index dropped 0.7 percent to 114.56 as of 3:09 p.m. in Tokyo. The gauge has slumped 5.5 percent from a 13-month high on Oct. 20 amid concerns the withdrawal of stimulus measures will cause the global recovery to falter. European stock-index futures also declined. Brent crude oil for December settlement declined as much as 78 cents, or 1 percent, to $78.11 a barrel on the London-based ICE Futures Europe exchange. The contract traded at $78.33 at 4:08 p.m. Singapore time. Nov. 5 (Bloomberg) -- Oil traded near $80 a barrel in New York after climbing to a one-week high yesterday as a government report showed supplies unexpectedly declined in the U.S., the world’s biggest energy user. Crude stockpiles fell 3.94 million barrels last week, the U.S. Energy Information Administration said yesterday. A 1.5 million-barrel increase was forecast, according to a Bloomberg News survey of analysts. Oil also advanced as the dollar weakened against the euro, bolstering the appeal of commodities as an alternative investment. “The EIA report provided some support and the U.S. dollar was soft, helping the oil price,” David Moore, a commodity strategist at Commonwealth Bank of Australia Ltd. in Sydney, said by telephone. Crude oil for December delivery traded at $80.15 a barrel, down 25 cents, in electronic trading on the New York Mercantile Exchange at 8:44 a.m. Singapore time. Yesterday, the contract rose 80 cents, or 1 percent, to settle at $80.40, the highest close since Oct. 23. Prices have gained 80 percent this year. The dollar traded at $1.4866 against the euro at 8:48 a.m. in Singapore, after sliding as much as 1.3 percent yesterday, the biggest intraday decline since Sept. 8. It touched $1.4909, the weakest level since Oct. 27. Stockpiles of crude fell to 335.9 million last week, the Energy Department said. Imports of crude oil dropped 764,000 barrels, or 8.6 percent, to 8.13 million barrels a day, the lowest level since Aug. 14, the report showed. Gasoline stockpiles fell 287,000 barrels to 208.3 million last week. A 400,000-barrel increase was forecast, according to the median of 17 responses in the Bloomberg News survey. Distillate supplies dropped 378,000 barrels to 167.4 million, the report showed. A 1 million-barrel decline was forecast. Total fuel demand over the four weeks ended Oct. 30 was 4.5 percent lower than the same period a year earlier, the report showed. Refineries operated at 80.6 percent of capacity, down 1.2 percentage points from the previous week and the lowest rate since the week ended April 10, the department said. Brent crude for December settlement rose 78 cents, or 1 percent, to $78.89 a barrel on the London-based ICE Futures Europe exchange yesterday. Nov. 5 (Bloomberg) -- The yen rose against the euro and dollar as Japan’s stocks declined amid concerns the global economic recovery will be slow, boosting demand for the Japanese currency as a refuge. The yen advanced against all 16 major counterparts before a report tomorrow forecast to show the U.S. jobless rate climbed last month. The New Zealand dollar dropped after Reserve Bank Governor Alan Bollard said the nation’s recovery from the global recession will be slower than Australia’s and the statistics bureau reported that the jobless rate climbed to the highest level in more than nine years. The yen rose to 134.52 per euro at 9:54 a.m. in Tokyo from 134.85 in New York yesterday. It climbed to 90.59 per dollar from 90.72. The dollar traded at $1.4852 per euro from $1.4861. The Nikkei 225 Stock Average fell 0.6 percent. The dollar traded near the lowest level in a week against the euro after the Federal Reserve reiterated a pledge to keep borrowing costs near zero, helping its $1 trillion injection into the economy to revive growth. The Fed yesterday reiterated its intention to keep interest rates “exceptionally low” for “an extended period” as long as inflation expectations are stable and unemployment fails to decline. Policy makers held the target rate for overnight lending between banks at zero to 0.25 percent. U.S. employers eliminated 175,000 jobs in October after a reduction of 263,000 in September, according to the median forecast of 84 economists in a Bloomberg survey. The Labor Department report is due tomorrow. Another government report tomorrow is forecast to show the unemployment rate in the U.S. probably rose to 9.9 percent last month from 9.8 percent in September. CPO 3rd month Jan futures contract surge RM70 higher as compare to previous trading sessions to close at RM2260 with a total of 10,758 lots traded in the market. CPO price was opened higher due to firm trading for crude oil and soybean oil overnight trading. 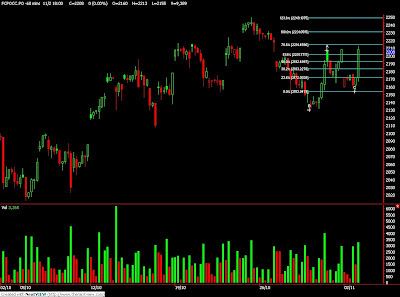 CPO price continue to trade higher after long consolidation in the morning trading sessions. Technically, CPO price surge fiercely after manage to break previous resistance levels at RM2230 region after long attempt to penetrate the resistance levels. Based on our technical view, our opinion suggests CPO price would trade higher in the coming trading sessions while be cautious around resistance levels at RM2291 and RM2320 regions. Traders were advice to hold long position in the coming trading session provided support levels at RM2207 and RM2154 must not be violated during trading sessions. FKLI Nov Futures contract traded surge 23.5 points higher to close at 1261 levels as compare to previous trading session to with a total of 6,485 lots traded in the market. FKLI opened higher despite Dow Jones overnight was closed weak while Nikkei exchange was not traded positively. Technically, FKLI surge north after manage to break up from the symmetric triangle’s resistance trend line in hourly price chart. 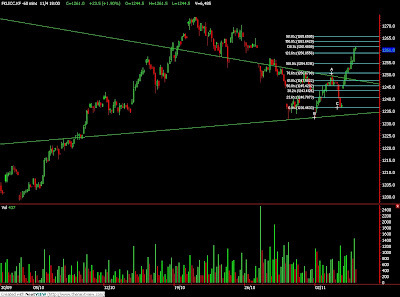 Based on our technical view, our opinion suggests FKLI would continue to surge higher support levels at 1250 and 1237 were not violated in the coming trading sessions. Traders were advice to hold long position in the coming trading sessions while be cautious around resistance levels at 1265 and 1273 regions. Nov. 3 (Bloomberg) -- Crude oil rebounded from a two-week low as gold surged to a record in New York after India’s central bank purchased 200 metric tons of the metal from the International Monetary Fund. Oil climbed 1.9 percent as the Indian gold purchase bolstered the appeal of commodities. Crude also got a technical bounce after touching $76.55 a barrel, the lowest intraday price since Oct. 15. When futures don’t drop further after reaching a new low, technical traders see it as a sign to purchase the contract. “Oil is turning into a financial asset, the same type of thing as gold,” said Bill O’Grady, chief market strategist at Confluence Investment Management in St. Louis. Crude oil for December delivery climbed $1.47, or 1.9 percent, to settle at $79.60 a barrel at 3:03 p.m. on the New York Mercantile Exchange. Oil has risen 78 percent this year. Prices were down from the settlement after the American Petroleum Institute reported at 4:30 p.m. that U.S. crude-oil stockpiles declined as supplies of distillate fuel, a category that includes heating oil and diesel, increased last week. December oil was up $1.27, or 1.6 percent, to $79.40 a barrel in electronic trading at 4:35 p.m.
Oil fell as much as 2 percent earlier today on the announcement that Royal Bank of Scotland Group Plc and Lloyds Banking Group Plc received a second bailout from U.K. taxpayers, signaling that the global economy may take longer to recover from the worst recession since the 1930s. Gold futures for December delivery rose $30.90, or 2.9 percent, to $1,084.90 an ounce on the Comex division of the New York Mercantile Exchange, a record settlement price. The contract touched $1,088.50, the all-time high intraday price. The previous record was $1,072 an ounce, set on Oct. 14. The Reuters/Jefferies CRB Index of 19 commodities advanced 1.1 percent to 276.43. High inventories and weak demand have been shrugged off by investors over the past two years as they moved into commodities for better returns than in other markets, said Edward Morse, head of economic research at LCM Commodities LLC. There is “overwhelming” evidence that oil’s gain this year has been caused by the flow of funds into commodities rather than a cut in supply by OPEC and a global economic recovery, Morse said. “One of the main lessons of the last five years is the new role played by global liquidity and the search for higher returns,” he said. Crude oil has outperformed stocks and bonds this year as it heads for the seventh annual gain in eight years. The Standard & Poor’s 500 Index has risen 15 percent in 2009 through yesterday while returns on the benchmark 10-year U.S. Treasury note are down 5.7 percent. The Organization of Petroleum Exporting Countries agreed to reduce production targets by 4.2 million barrels to 24.845 million barrels a day last year to bolster prices. An Energy Department report tomorrow is forecast to show that U.S. crude oil and gasoline stockpiles rose last week as supplies of distillate fuel dropped. Stockpiles of crude oil rose 1.5 million barrels in the week ended Oct. 30, according to the median of 16 estimates by analysts surveyed by Bloomberg News. Gasoline supplies probably increased 400,000 barrels, the survey showed. Distillate fuel inventories declined 1 million barrels. Gasoline for December delivery increased 1.01 cents, or 0.5 percent, to end the session at $2.0004 a gallon in New York. Heating oil for December delivery climbed 2.73 cents, or 1.3 percent, to end the session at $2.0733 a gallon. Brent crude for December settlement increased $1.56, or 2 percent, to end the session at $78.11 a barrel on the London- based ICE Futures Europe exchange. Oil volume in electronic trading on the Nymex was 524,786 contracts as of 3:14 p.m. in New York. Volume totaled 555,171 contracts yesterday, 2.8 percent lower than the average over the past three months. Open interest was 1.2 million contracts. The exchange has a one-business-day delay in reporting open interest and full volume data. Demand for the dollar may also decline as gold surged to a record high after India’s central bank bought 200 metric tons of the metal from the International Monetary Fund. The euro was poised to advance versus the pound before a report forecast to show German factory orders advanced in September for a seventh month, adding to signs the recession is easing in the 16-nation region that uses the single currency. The dollar traded at $1.4728 per euro at 8:36 a.m. in Tokyo from $1.4724 in New York yesterday. The greenback was little changed at 90.41 yen. The euro was at 133.17 yen from 133.01 yen. The euro was at 89.64 British pence from 89.59 pence. Gold futures for December delivery rose to a record $1,088.50 an ounce yesterday in after-hours trading on the New York Mercantile Exchange’s Comex unit. The Fed will release its monetary policy statement today at the end of a two-day meeting. Policy makers will hold the benchmark interest rate target in a range between zero and 0.25 percent, according to the median estimate of economists in a Bloomberg News survey. The euro may advance as the Economy Ministry in Berlin is expected to report German factory orders rose 1 percent in September after gaining 1.4 percent in August, according to another Bloomberg survey. The data is due on Nov. 6. FKLI Nov Futures contract traded fall 8 points lower to close at 1237.5 levels as compare to previous trading session to with a total of 4,778 lots traded in the market. FKLI opened slightly higher as Dow Jones overnight was closed higher but traded south since as regional indices were traded lower due to unfavorable news released. Technically, FKLI seems failed to penetrate resistance trend line around 1250 regions in the hourly chart. 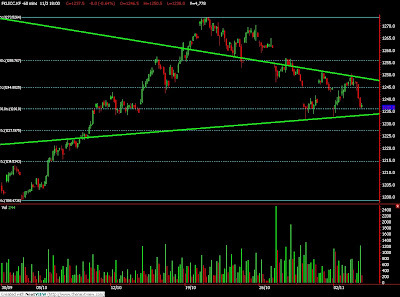 It appears that hourly price chart formed a symmetric triangle pattern. Based on our technical view, our opinion suggests FKLI would trade lower provided support level at 1233 and 1227 were not able to hold against selling pressure. Traders were advice to hold short position while be cautious around resistance levels at 1241 and 1248 regions. CPO 3rd month Jan futures contract traded RM18 lower as compare to previous trading sessions to close at RM2190 with a total of 7,037 lots traded in the market. CPO price was opened higher but retrace lower and consolidate ever since opening due to some profit taking activity as crude oil and soybean oil electronic trading were traded weak despite manage to close firm on overnight trading. Technically, CPO price retrace towards 50% Fibonacci support levels at RM2187 regions after several attempt to test the support level. Based on our technical view, our opinion suggests CPO price would likely to continue trade higher in the coming trading sessions provided support levels at RM2154 and RM2130 were not violated during trading session. Traders were advice to hold long position applying long on dip strategy in the coming trading session while be cautious around resistance levels at RM2208 and RM2231 regions. Nov. 3 (Bloomberg) -- Crude oil was little changed in New York after rising yesterday as data showing global manufacturing expanded signaled that fuel demand may increase. Oil traded above $78 a barrel after the Institute for Supply Management said its U.S. factory index rose to a three-year high in October. Yesterday’s Chinese data showed the country’s manufacturing expanded at its fastest pace in 18 months. Crude oil for December delivery was at $78.16 a barrel, up 3 cents, on the New York Mercantile Exchange at 12:26 p.m. Singapore time. The contract yesterday gained $1.13, or 1.5 percent, to settle at $78.13 a barrel. Crude has risen 75 percent this year. Prices had climbed yesterday as U.S. stocks increased, with the Dow Jones Industrial Average gaining 76.71 points, or 0.8 percent, to 9,789.44. Asian equities rose today, with five stocks gaining for every four that fell on the MSCI Asia-Pacific excluding Japan index. U.S. supplies of distillate fuel, a category that includes heating oil and diesel, declined 850,000 barrels last week from 167.8 million the prior week, according to a Bloomberg News survey of analysts. Stockpiles in the week ended Oct. 2 were at the highest level since January 1983. U.S. crude-oil inventories probably rose as imports and refinery utilization increased, the survey showed. Inventories of crude oil rose 1.5 million barrels in the week ended Oct. 30 from 339.9 million the prior week, according to the median of 10 estimates by analysts before the department’s report this week. All 10 forecast a gain. Refineries operated at 82.1 percent of capacity, up 0.3 percentage point from the previous week. Gasoline inventories probably added 950,000 barrels from 208.6 million the week before, the survey showed. The Energy Department is scheduled to release its weekly report at 10:30 a.m. tomorrow in Washington. Brent crude for December settlement was at $76.65 a barrel, up 10 cents, on the London-based ICE Futures Europe exchange at 12:31 p.m. Singapore time. The contract yesterday climbed $1.35, or 1.8 percent, to $76.55 a barrel. Nov. 3 (Bloomberg) -- Palm oil declined as mounting stockpiles in Indonesia, the world’s biggest producer, boosted investor concern about excess supply. Inventories in the country probably climbed to 1.7 million tons in October from an average of 1.3 million to 1.4 million tons in August and September, Derom Bangun, a deputy chairman of Indonesia’s Palm Oil Board, said yesterday in Kuala Lumpur. Palm oil for January delivery dropped as much as 1 percent to 2,186 ringgit ($639) a ton on the Malaysia Derivatives Exchange and traded at 2,196 ringgit by the 12:30 p.m. break. Crude oil and soybean oil for December delivery were little changed at $77.99 a barrel in New York and 36.78 cents a pound in Chicago. Soybean oil’s premium over palm oil was 26 percent today, down from a three-month high of 32 percent on Oct. 21. Rising inventories may curb a 30 percent rally in palm oil futures this year, which outpaced a 9.4 percent gain in soybean oil. Crude oil advanced 75 percent. Palm oil production in Indonesia may reach 21.5 million tons to 22 million tons in 2010 as more plantations mature, from an expected 20.5 million tons this year, Bangun said. Exports will also be higher as economic growth boosts demand in China and India, he said. Indonesia postponed to July 2010 a requirement for commodity exporters to use letters of credit for shipments exceeding $1 million. The condition, scheduled to take effect Nov. 1, was postponed “because the aim of the rule should be reached without causing excessive burden to exporters amid a global recession that has not recovered,” a statement from Indonesia’s Department of Trade said today. PT Sinar Mas Agro Resources and Technology may build two palm oil processing plants for a total of $150 million, Bisnis Indonesia reported. Sinar Mas plans to build a palm oil-based food-processing plant in Jakarta and an oleochemical plant in Medan, North Sumatra, it reported. Nov. 2 (Bloomberg) -- The Organization of Petroleum Exporting Countries raised crude-oil production last month to the highest level in 10 months as members took advantage of higher prices, a Bloomberg News survey showed. Output averaged 28.76 million barrels a day in October, up 80,000 barrels from September, according to the survey of oil companies, producers and analysts. The entire gain came from the 11 OPEC members with quotas, all except Iraq. The 11 countries pumped 26.31 million barrels a day, 1.465 million barrels above their target. Iraqi output was unchanged. OPEC cut output quotas by 4.2 million barrels to 24.845 million barrels a day last year as fuel demand tumbled during the worst recession since the 1930s. The group, which left the targets unchanged at a Sept. 9 meeting in Vienna, is set to meet again on Dec. 22 in Luanda, Angola. “They are looking at prices near $80, and a stronger economic picture, and have decided it’s a good time to earn a bit more,” said Rick Mueller, a director of oil markets at Energy Security Analysis Inc. in Wakefield, Massachusetts. Crude prices have more than doubled from a four-year low of $32.40 a barrel reached at the end of last year, which caused OPEC to make production curbs. Oil has traded between $65 and $82 since Aug. 1. Oil for December delivery rose $1.13, or 1.5 percent, to settle at $78.13 a barrel at 2:51 p.m. on the New York Mercantile Exchange, as manufacturing expanded in the U.S. and China in October, signaling energy demand is rising in the world’s two biggest oil-consuming countries. “Until inventories get so high that prices have to fall, or we get bad economic news from the U.S. or China, you can expect OPEC to continue to squeeze additional barrels out of their fields,” Mueller said. OPEC had 5.74 million barrels a day of spare capacity last month, down from 5.82 million in September, the survey showed. Saudi Arabia can increase daily output by 2.65 million barrels, the most of any member. OPEC’s two West African members, Nigeria and Angola, had the biggest production increases last month. Nigeria’s output rose 70,000 barrels to an average 1.875 million barrels a day in October, the highest since December. Production was 202,000 barrels a day above the country’s quota. A cease fire and amnesty agreement with the Movement for the Emancipation of the Niger Delta, the country’s main militant group, has allowed Nigeria to regain ground lost during the summer. Angola increased production by 65,000 barrels to 1.88 million barrels a day last month, the most since August 2008. Angola pumped 363,000 barrels a day above its target. The Chevron Corp.-operated Tombua-Landana and Mafumeira Norte offshore fields were responsible for most of the increase. The company began pumping oil at Tombua-Landana in August and at Mafumeira Norte in July. “The oil majors have sunk a lot of money in Angola’s deepwater projects and want a decent return on their investment,” Mueller said. Nigerian and Angolan crude grades are light, low-sulfur varieties favored by U.S. refiners for the quantity of gasoline they yield. Saudi Arabia, OPEC’s biggest producer, pumped 8.15 million barrels of crude oil a day in October, down 50,000 barrels from the previous month. Production was 99,000 barrels a day above the country’s quota of 8.051 million. The kingdom’s September total was revised 185,000 barrels higher. Production from the Khurais and Nuayyim fields, which came on line this year, were responsible for much of the gain. Kuwait and Qatar were the only OPEC members to keep within their targets in October. Kuwaiti output rose 15,000 barrels a day to 2.2 million, according to the survey. Output was 22,000 barrels a day lower than the country’s quota. Qatar, the second-smallest producer in the group, pumped 720,000 barrels a day last month, unchanged from September and 11,000 barrels below its target. Work to expand output of the country’s Al-Shaheen grade didn’t affect October loadings. Iran produced 3.78 million barrels a day in October, unchanged from the prior month, the report showed. The country pumped an average 444,000 barrels a day above its target, making it the least compliant with output limits. Venezuelan output dropped 10,000 barrels to 2.22 million barrels a day last month. The South American country pumped 234,000 barrels above its target of 1.986 million a day. Venezuela has the third-worst quota compliance, after Iran and Angola. The United Arab Emirates reduced output by 20,000 barrels to 2.25 million barrels a day, the second-biggest decline after Saudi Arabia. Production was 27,000 barrels a day above the country’s quota. Libyan production fell 10,000 barrels a day to 1.51 million, the survey showed. The dip came amid lower output from fields operated by Suncor Energy Inc.’s Petro-Canada unit. FKLI Nov Futures contract traded unchanged to close at 1245.5 levels as compare to previous trading session to with a total of 5,291 lots traded in the market. FKLI opened lower due to Dow Jones weak overnight closing while regional indices plunge on open session. However, FKLI slowly recovered upon closing due to some profit taking for the overnight short position. 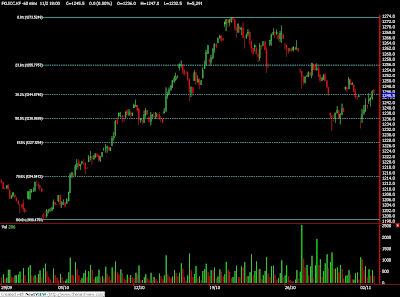 Technically, FKLI seems well supported above 1236 support levels; 50% Fibonacci support level in the hourly price chart. 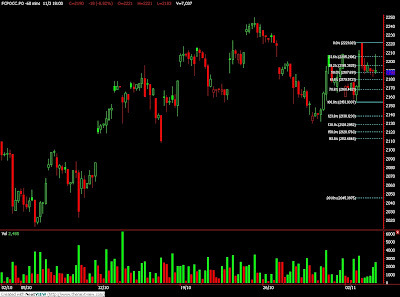 Based on our technical view, our opinion suggests FKLI would trade higher in the coming trading session provided support levels at 1236 and 1227 were not violated during trading sessions. 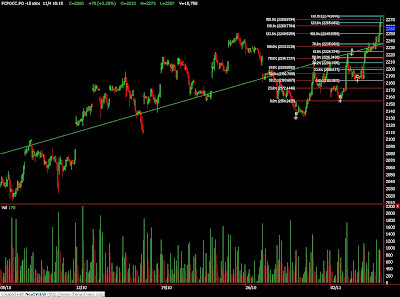 Traders were advice to hold long position I while be cautious around resistance levels at 1265 and 1272 regions. CPO 3rd month Jan futures contract traded unchanged as compare to previous trading sessions to close at RM2208 with a total of 9,389 lots traded in the market. CPO price recovered after opened lower trading in the morning sessions as crude oil and soybean oil were traded weak during overnight trading but manage to rebound during electronic trading which directly affects CPO price movement. Technically, CPO price manage to retrace towards 50% Fibonacci support levels at RM2160 regions despite manage to close highest on last Friday trading sessions. Based on our technical view, our opinion suggests CPO price would trade higher in the coming trading session as CPO price currently riding on wave count of 3 in the hourly chart. Traders were advice to hold long position provided support levels at RM2160 and RM2130 were not violated during trading sessions. Resistance levels were seen at RM2231 and RM2260 regions. MUMBAI, Oct 30 (Reuters) - India soybean futures extended gains on Friday, supported by hopes of domestic and export demand for soymeal and a firm Malaysian palm, analysts said. Soybean is crushed to produce soymeal and soyoil. However, rising arrivals in the domestic spot market kept the upside limited, they added. "There is a likelihood of a price correction in the near-term and that such high level is not sustainable," Kotak Commodity Services Ltd said in a broker note. Traders said arrivals have crosses 1.2 million bags of 100 kg each across India. The most-traded November contract NSBX9 on the National Commodity and Derivatives Exchange ended 0.94 percent higher at 2,209 rupees per 100 kg, after gaining 1.32 percent in the previous session. Nov. 2 (Bloomberg) -- Crude oil fell to a two-week low on speculation the global economic recovery remains weak and dependent on government stimulus for sustained growth. A report today in the U.S., the world’s largest oil consumer, will probably show construction spending fell 0.2 percent in September, after rising from a five-year low in July. OPEC members probably increased crude production last month to benefit as prices climbed to a one-year high, according to a Bloomberg News survey. Crude oil for December delivery fell as much as 44 cents, or 0.6 percent, to $76.56 a barrel in after-hours electronic trading on the New York Mercantile Exchange, its lowest intraday price since Oct. 15. It was at $76.63 at 10:51 a.m. in Sydney. The contract dropped 4.3 percent last week, its first decline in a month, after U.S. oil and gasoline stockpiles rose, equity prices fell and a stronger dollar reduced the appeal of commodities. Prices slumped 3.6 percent on Oct. 30 after a report showed U.S. consumer spending fell for the first time in five months in September. Brent crude for December settlement fell 21 cents, or 0.3 percent, to $74.99 a barrel on the London-based ICE Futures Europe exchange at 10:48 a.m. in Sydney. It dropped 3.6 percent to $75.20 on Oct. 30. The U.S. economy is still tough for “huge numbers of American businesses” and the recovery will take time, Treasury Secretary Timothy Geithner said in an interview on NBC’s “Meet the Press” program. “It could be a little choppy. It could be uneven. And it’s going to take awhile,” he said. The world risks a second slump if nations withdraw government stimulus programs too soon, Chinese Commerce Minister Chen Deming told an economics conference in Shanghai Oct. 31. New York oil futures climbed to a one-year high of $82 a barrel on Oct. 21 as the dollar slid to a 14-month low against a basket of major currencies. Prices gained 72 percent the past eight months as rising equity markets emboldened investors and the weaker dollar steered funds into commodities. The Standard & Poor’s 500 Index slumped 4 percent last week, its biggest decline since mid-May. Further weakness may be enough to slow the dollar’s decline and undermine the short-term outlook for commodities, Hassall said. Hedge-fund managers and other large speculators increased their bets on rising oil prices to a 19-month high last week, according to U.S. Commodity Futures Trading Commission data. Speculative net-long positions, the difference between orders to buy and sell the commodity, jumped 47 percent to 109,619 contracts in the week ended Oct. 27, the commission said Oct. 30. They are at their highest since March 14, 2008. Oct. 30 (Bloomberg) -- Gold fell, capping the first weekly loss since late last month, as a strengthening U.S. dollar cut demand for the precious metal as an alternative asset. Investment in the SPDR Gold Trust, the biggest exchange- traded fund backed by bullion, slipped 0.3 percent this week as the dollar rebounded from a 14-month low against the euro. Gold reached a record $1,072 an ounce on Oct. 14. “If it appears that the dollar can strengthen, it can lead stocks down, and gold is going to slip,” said Frank McGhee, the head dealer at Integrated Brokerage Services LLC in Chicago. The Standard & Poor’s 500 Index fell as much as 3.1 percent, heading for the steepest drop in almost four months. Gold futures for December delivery fell $6.70, or 0.6 percent, to $1,040.40 an ounce on the New York Mercantile Exchange’s Comex division. The metal sank 1.5 percent this week as the U.S. Dollar Index, a six-currency measure of the greenback’s value, rose 1.1 percent. The last time gold posted a weekly loss was Sept. 25. The dollar rallied after U.S. business activity expanded in October, according to the Institute for Supply Management- Chicago Inc. The group said its gauge of activity rose to 54.2 in October, a 13-month high, from 46.1 last month. The median forecast of 58 economists in a Bloomberg survey was for an advance to 49. Readings below 50 signal contraction. “Gold is just following moves in the dollar,” McGhee said. Today’s decline “could bode poorly for next week,” he said. Thirteen of 23 traders, investors and analysts surveyed by Bloomberg, or 57 percent, said bullion will fall next week. Seven forecast higher prices and three were neutral. Gold climbed 3.1 percent this month, the second straight gain. The drop in prices this week may be a buying opportunity, some analysts said. The bank expects gold to average $1,150 in 2010. Gold will be higher in six months as investors worldwide turn to the precious metal to preserve wealth, said Dennis Gartman, an economist in Suffolk, Virginia. Gartman is also a hedge-fund manager and the editor of the Gartman Letter. Gold is headed for a ninth straight annual gain. The metal also reached record values in euros and U.K. pounds earlier this year. In other metals markets, silver futures for December delivery dropped 40 cents, or 2.4 percent, to $16.255 an ounce on the Comex. The metal slid 8.3 percent this week. Platinum for January delivery fell $11.90, or 0.9 percent, to $1,326.30 an ounce on the Nymex, and December palladium sank $5.05, or 1.5 percent, to $323.25 an ounce. Platinum declined 3.2 percent this week and palladium fell 4.8 percent. “A less-euphoric outlook to global growth may help explain why the price declines in silver and platinum have been more severe than gold over the past week,” Deutsche Bank analysts said. Silver fell the most in a week since February while platinum’s weekly loss was the most since late September. This month, silver declined 2.4 percent, while platinum has rallied 1.8 percent and palladium surged 8 percent. All three metals have wider industrial applications than gold. Nov. 2 (Bloomberg) -- The yen rose to the most in almost three weeks against the dollar and the euro after New York-based CIT Group Inc. filed for bankruptcy, boosting demand for Japan’s currency as a shelter from financial turmoil. CIT listed $71 billion in assets and $65 billion in debt, according to the bank’s filing. The Australian and New Zealand dollars fell against the greenback on concerns Asian stocks will extend last week’s rout in European and U.S. equities. The yen rose to 89.23 against the dollar as of 7:44 a.m. in Tokyo from 90.09 yen in New York on Oct. 30, after earlier touching 89.21 yen, the most since Oct. 14. It reached 131.03 against the euro, the strongest since Oct. 9, before trading at 131.77, from 132.61 in New York. Japan’s currency was at 79.49 against the Australian dollar from 81.05 on Oct. 30. Australia’s currency fell to 89.13 U.S. cents from 89.97 cents in New York on Oct. 30. New Zealand’s dollar declined to 70.83 U.S. cents, near the least since Oct. 2, from 71.81 in New York last week. U.S. stocks fell the most since May last week, with the Standard & Poor’s 500 index dropping 4 percent. U.S. taxpayers probably won’t recoup much, if any, of the $2.3 billion in government funds that went to CIT Group, Treasury Department spokesman Andrew Williams said in an e- mailed statement after the 101-year-old commercial lender filed for bankruptcy protection. “The U.S. financial system is far from a perfect health,” said Mitsuru Saito, chief economist in Tokyo at Tokai Tokyo Securities Co. in Tokyo. Employers in the U.S. cut fewer jobs this month than in September while the unemployment rate rose to 9.9 percent in October, according to the median forecast in a survey of economists. The Labor Department’s report is due Nov. 6. Nobel Prize-winning economist Joseph E. Stiglitz said the U.S. recession is “nowhere near” an end and the economy’s third-quarter growth rate of 3.5 percent, the first expansion in more than a year, won’t carry into 2010. Futures traders decreased their bets that the euro will gain against the U.S. dollar, figures from the Washington-based Commodity Futures Trading Commission showed. The difference in the number of wagers by hedge funds and other large speculators on an advance in the euro compared with those on a drop -- so-called net longs -- was 32,869 on Oct. 27, compared with net longs of 36,033 a week earlier. Futures are agreements to buy or sell assets at a set price and date. The figures reflect holdings in currency-futures contracts at the Chicago Mercantile Exchange as of Tuesday. FKLI Oct Futures contract rebound 6 points higher to settle at 1244.5 levels as compare to previous trading session to with a total of 2,753 lots traded in the market. FKLI was traded lower during later sessions despite was opened higher due to strong Dow Jones overnight closing and affirmative regional indices during trading sessions. Technically, FKLI was rebound 50% Fibonacci resistance levels at 1251 regions without an attempt to penetrate wave 1 end count at 1253 levels. Based on our technical view, FKLI would continue to trade lower if support levels at1240 and 1235 were fail to hold against the selling pressure in the coming trading sessions. 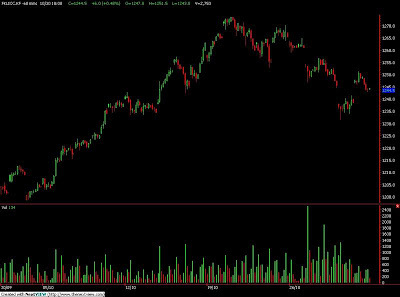 However, traders were still advice to hold long position in the coming trading sessions while put tight stop loss around support levels if support levels were violated during trading sessions. Resistance levels were seen at 1253 and 1265. CPO 3rd month Jan futures contract rose RM19 higher as compare to previous trading sessions to close at RM2208 with a total of 7,464 lots traded in the market. CPO price was traded within wide range as it opened on highest after traded lower due to some profit taking from overnight position. 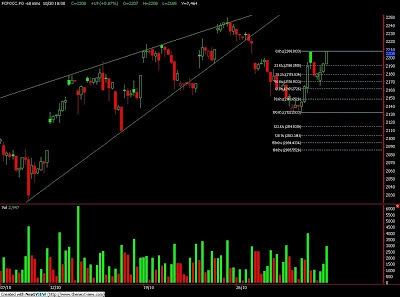 Technically, CPO complete 423.6% Fibonacci resistance levels at 2208 levels after manage to found support at RM2165 at 78.6% Fibonacci support level in the 5 min price chart to complete 1st wave count. Based on our technical view, our opinion suggests CPO price would retest support levels at RM2161 and RM2148; both 61.8% and 78.6% Fibonacci support levels. However, traders were advice to hold long position in the coming trading session provided support levels were not violated during trading sessions. Resistance levels were seen at RM2220 and RM2250 regions.